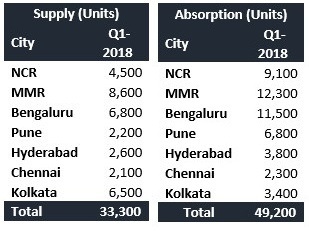 A closer look at the city-level data of a q-o-q launch analysis clearly reveals a massive increase in Bengaluru’s housing launch supply - from 3,000 units in Q4 2017 to 6,800 units in Q1 2018, accounting to nearly 127% increase. The data further reveals that unsold housing stock in the city declined by nearly 5% - from 96,000 units in Q4 2017 to 91,000 units in Q1 2018. Also, property prices have seen a marginal increase of 1% from Q4 2017 to Q1 2018, with the current average property prices in Bengaluru being ₹4,850/sq.ft. Besides housing many HNIs, the city is also home to several mid-level IT professionals who have added to the demand for mid-segment (₹ 40 lakh - ₹ 80 lakh) housing. 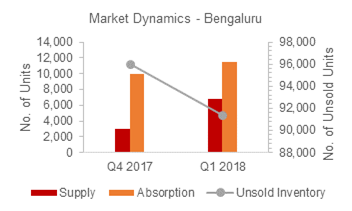 Micro markets that have multiple options in this segment include Whitefield, Outer Ring Road, Sarjapur Road, and Electronic City, and also a few locations in North Bengaluru. Affordable housing options (< ₹40 lakh) are also fast catching up in the suburbs of Hosur Road, Mysore Road, etc. Out of total 6,800 units launched in Q1 2018, nearly 84% (5,700 units) fall in the mid-segment category. Of these, the majority were launched in South Bengaluru and North Bengaluru (which accounted for 34% and 31% of the mid-segment supply respectively). The supply in the critical mid-segment category has seen a major uptick in Q1 2018 - from 1,400 units in Q4 2017 to 5,700 units in Q1 2018. Overall, the mid-segment housing category saw an increase of more than 300% in this quarter, while the ultra-luxury segment saw a decline. In North Bengaluru, the proposed developments including the Information Technology Investment Region (ITIR), aerospace SEZ, Devanahalli Business Park, Global Financial District, etc. are driving growth. Proximity to the airport, the elevated expressway and metro rail corridor development have also upped the game for North Bengaluru. In West Bengaluru, availability of large land parcels, its industrial areas and metro rail corridor development have been the main residential market boosters. This region will see a major infusion of residential developments in the future.